The RAM-D-202U-IN1 2.5" Round Base AMPs Hole Pattern & 1.5" Ball features a 1.5" rubber ball attached to a reinforced steel 2.5" diameter round base with AMPS hole pattern. 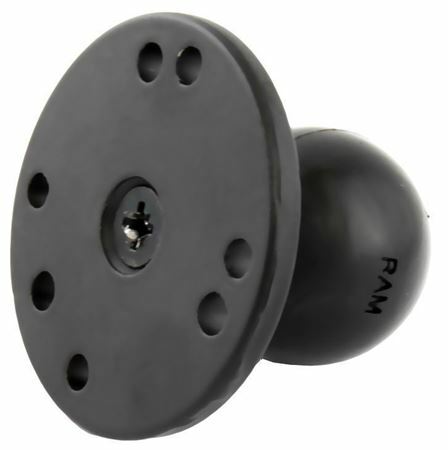 The RAM-D-202U-IN1 RAM 2.5" Round Base AMPs Hole Pattern, Steel Reinforced Post & C Size 1.5" Ball from the RAM Mount Bases range is made of a steel reinforced post connected to a 1.5” diameter rubber ball, with a single flat 2.5” diameter base. The product is built with the pre-drilled industry standard AMPS universal hole design, allowing for maximum compatibility with other products on the market.